NOTE: This edition has a linked “Table of Contents” and has been beautifully formatted (searchable and interlinked) to work on your Amazon e-book reader or iPod e-book reader. Sweeney Todd is a character who first appeared as one of the protagonists of a penny dreadful serial entitled The String of Pearls (1846-1847). 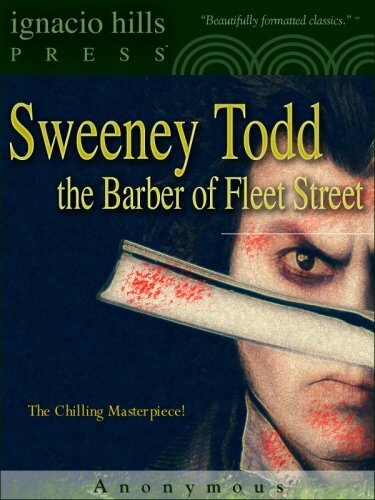 It’s claimed that Sweeney Todd was a real person. Sweeney Todd is a barber who murders wealthy customers by pulling a lever while they are in his barber chair which, unknown to them, is fixed to a revolving trap-door, making them fall backward into the basement, generally causing them to break their necks or skulls as they hit the ground. Just in case they are alive, he goes to the basement and “polishes them off.” After Todd has robbed his dead victims of their goods, Mrs. Lovett, his partner in crime (in some later versions, his friend who wants to become his lover), assists him in disposing of the bodies by having their flesh baked into meat pies, and selling them to the unsuspecting customers of her pie shop. The tale surrounding the character became a staple of Victorian melodrama, and later a Tony award-winning Broadway musical in 1979. Sweeney Todd has also been featured in several films, the most recent being based on the musical Sweeney Todd: The Demon Barber of Fleet Street (2007), directed by Tim Burton, with Johnny Depp in the title role. Full of intrigue and adventure, this classic is a must for adventure-pulp literature fans!